Today marks the 2nd annual Ada Lovelace Day — an “international day of blogging to celebrate the achievements of women in technology and science.” Ada Lovelace was the daughter of Lord Byron who, in the 1840s, earned the distinction of becoming the first computer programmer. I, like many others today, have chosen to write about an early pioneer in computing: Grace Murray Hopper (1906-1992). 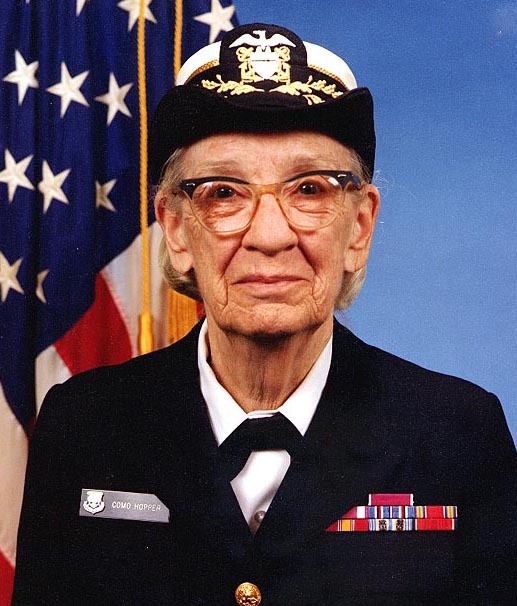 Grace Hopper–or the Grand Old Lady of Software, as she was often known–was a computer scientist, mathematician, technology innovator, and pioneer in computer programming languages. She also had a long-standing distinguished career in the U.S. Navy as an officer. The list of achievements for “Amazing” Grace are quite impressive. During World War II, she worked at Harvard on code for the Mark I, the first programmable digital computer in the U.S. Her programming efforts at Harvard continued with work on the succeeding Mark II computer. It was during her work on the Mark II that a dead moth was found stuck in a relay inside the computer causing the relay to stop working properly. 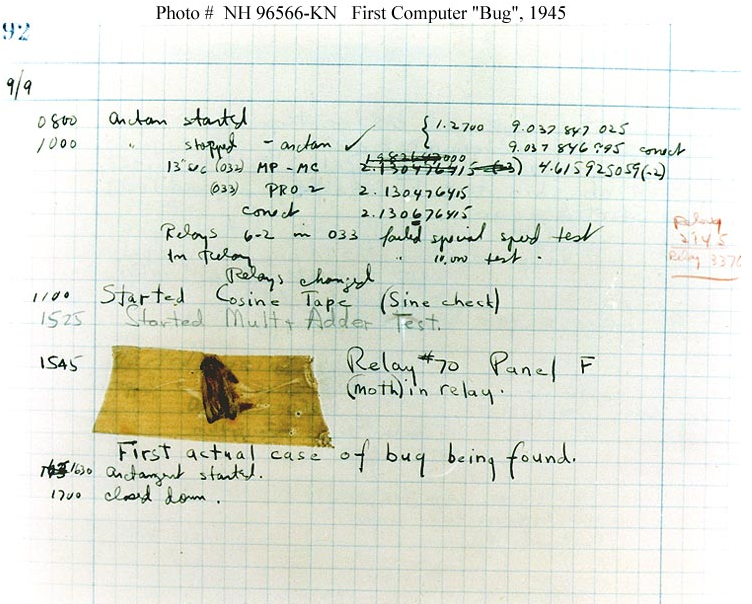 The moth was removed, taped into the log notebook, and noted as having been found in the computer. Hopper coined the term “bug” to refer to computer glitches. Following her work on the Mark computers, Hopper developed compilers, including FLOW-MATIC. This compiler for business applications was the first computer language to use English words rather than mathematical symbols. Hopper also played a major role in the invention of COBOL language. 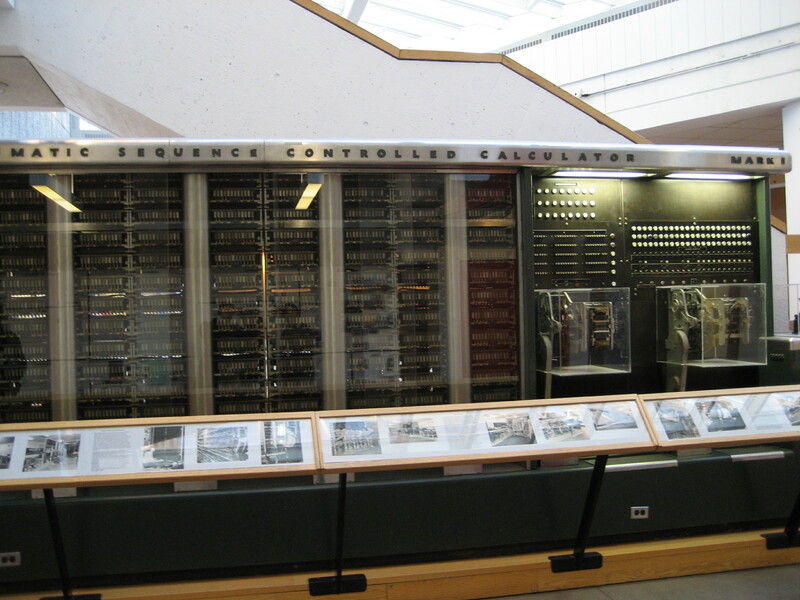 COBOL (Common Business-Oriented Language), heavily influenced by Hopper’s FLOW-MATIC, became the most widely-used business computer program of its time. Hopper also helped to modernize the Navy with her work on COBOL. After 43 years of service in the Navy, Hopper retired with the rank of Rear Admiral. At the time of her retirement in 1986, she was the oldest commissioned naval officer on active duty. In 1991, she was awarded the National Medal of Technology, becoming the first woman to receive it individually. Hopper was also inducted into the Engineering and Science Hall of Fame in Dayton, Ohio in 1984. Hopper became an avid spokesperson for education following her retirement. In speaking engagements, she would encourage her listeners not to fear risk-taking and to pursue innovation. 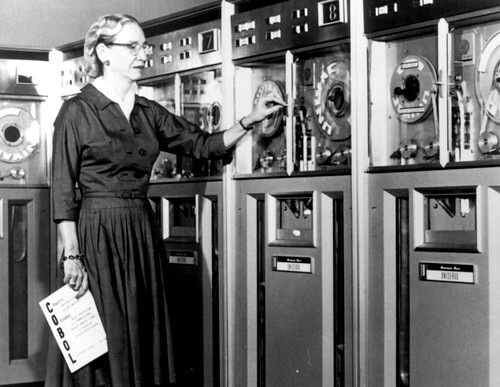 Here’s to Grace Hopper–an early contributor to what we now know as the information age.